Dubai: Shabab Al Ahli and Al Wahda go into Friday’s Arabian Gulf Cup final at Hazza Bin Zayed Stadium with their eyes firmly on the prize. The Clarets made it to the final after beating Bani Yas 4-1 in the semi-final, while Shabab Al Ahli defeated Al Nasr on penalties after a 1-1 draw. Luvannor was omitted from the starting line-up up of Shabab Al Ahli’s opening game in the Cup against Al Wahda. He came on as a second half substitute but failed to guide his team to their first three points as they lost 1-0. He played every minute of the rest of his side’s games on the way to the final. The 28-year-old netted two goals against Bani Yas in the group stage and grabbed an assist against Al Jazira in the quarter-final. Luvannor is a proven threat in both creating and finishing chances in front goal. The Ecuadorean forward faces tough competition from his teammate Ahmed Khalil for a spot in the starting line-up. He came on as a late substitute in the semi-final game but remains the team’s top goalscorer. Ayoví has netted three goals in six cup games this season and is known for his physical strength. Shabab Al Ahli’s right back shows impressive offensive qualities which provide his side with several options on the right side of the field. The No. 9 is one of the most important players for the team. 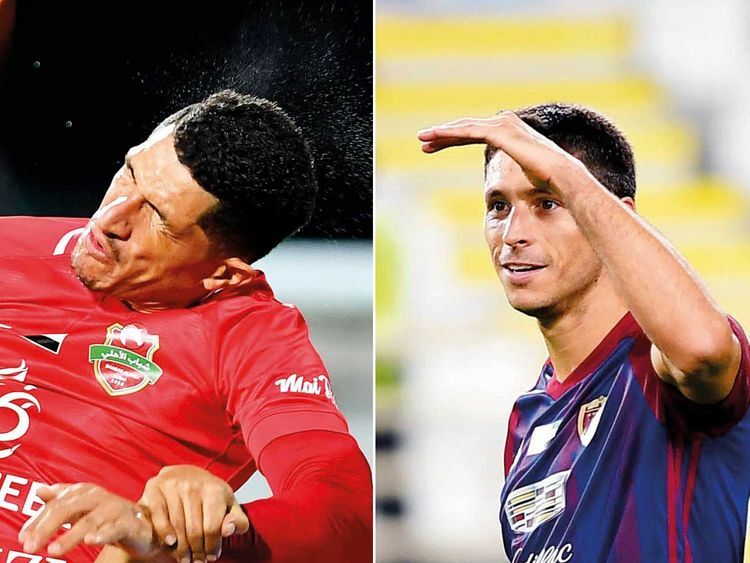 Leonardo da Souza has been putting in impressive performances in the cup with Al Wahda. The Brazilian netted six goals to become their top goalscorer in the competition, behind Al Ain’s Caio who netted seven goals. Da Souza also assisted a goal against Emirates Club in the quarter-final. Even when not at his best, Tagliabue continues to create problems for the opposition defences. The Argentine has netted three goals in the cup, and assisted three others. He scored all three of his strikes in his side’s last two games in the knockout stage, as he scored a goal against Emirates Club and a brace against Bani Yas. The veteran came in as a substitute in the 69th minute of Al Wahda’s semi-final encounter against Bani Yas and managed to assist two goals. He continues to pose constant threat with his decisive passes even if he wasn’t at his best. Al Wahda will need a player with such qualities to penetrate the Shabab Al Ahli defence.